The complete Joseph Raphael [1869-1950] Biography! For most of his career he remained a devoted follower of pure French Impressionism. 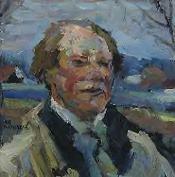 He painted the countryside near his home in Uccle, Belgium and also ventured to Holland and France to paint. Just as Raphael's international reputation grew, his family grew as well to include four daughters and one son. His family frequently appeared in his figurative works, he created wonderful closeup studies of his children and frequently captured them in leisurely picnic settings. Some of his other paintings were the beaches and coastal towns in Belgium, the area's local fields of flowers, and sometimes he featured his charming cottage home with its vegetable and flower gardens which were perhaps sources for his still lifes of fruits, vegetables and flowers. He lived and worked in Europe for thirty-seven years always maintaining close ties with the San Francisco art community and his loyal art dealer and collector Albert M. Bender. In 1939 with the ominous clouds of World War Two approaching, he returned to San Francisco where he lived and maintained a studio on Sutter Street until his death in 1950.